Make sure you are actually dealing with a company who can and does erect the buildings they sell. There are steel building brokers who will claim that they are a building erector when in reality the company has never erected a single building. A steel building broker or supplier who arranges for steel to be shipped to a project site but doesn't install the building is not a steel erector. Some building brokers and suppliers will lead customers to believe they erect steel buildings themselves but simply sub-contract or aimlessly pick an erector from the project area. The problem with this is that if something goes wrong the building broker or supplier will claim they are not responsible. These transactions often lead to contractors with an unknown reputation working on the project. 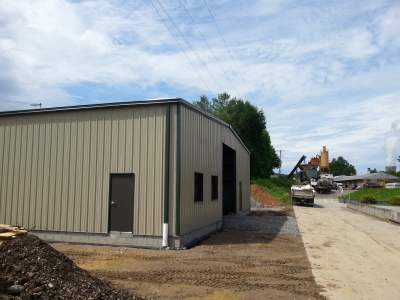 Ohio Steel Construction erects our own buildings. We have "boots on the ground" and we take full responsibility for the project from beginning to end. Don't get yourself into a situation where something goes wrong and everyone is pointing the finger at each other. Have a clear understanding of what is included in your building system. The company you deal with should be including the entire building system package that you need to complete the project and to price any further options you need. Make sure the company is not omitting needed items such as fasteners, trim, and components. Make sure it's not an "oh, you wanted fasteners with that? Sorry that's going to cost you extra" situation. Reputable companies like Ohio Steel Construction will not play this game, they will be able to price you the complete building package you want. Don't be misled by someone telling you they are the shipping manager and just happened to answer the wrong phone line, this is another sales tactic. When the phone is answered and the person on the other end plays a role of being someone other than who you should be talking to beware, it is just an bottom feeding company who is deceiving you to get a sale. If you have already worked with a company make sure to ask for the same person, they will be most familiar with your project. Trusting Ohio Steel Construction ensures you will be dealing with the same contact and company thoughout the building process. Don't fall for the canceled building pitch. Many of the brokers in this industry use this pitch to hard close customers and make it sound like it's a deal, "you have to act on it now or you will lose out." Ohio Steel Construction does not participate in sale tactics or sales schemes. It is rare for someone to order a building, put down money and walk away from that money. It is also rare that a company just happens to have a building so close to the size you want and it's been designed for the codes and loads of your area. If for some reason a company actually had a canceled building they typically recycle or repurpose the individual pieces to lower their cost burden. It would be extremely risky with a huge legal liability for a building manufacturer to knowingly allow a building to be shipped and erected at a location other than what it where it was engineered and stamped.